Ikea is just so accessible and the smallest things like a step stool or child sized hangers can really make a difference to the child's independence or ease in living and working in the home. We already have a lot of the basic furniture and materials you would find in a Montessori home, however I thought it would be fun to share what I picked up on my latest visit to Ikea! GODMORGON - Box with Lid, Set of 5, Clear - We are currently using this to hold collage materials but it is perfect for storing all kinds of materials. I love how it is clear so the children can easily see what is in it and each container has a little lid if needed. It would also be perfect on the nature table or in the kitchen. DJURA - Bed tray - We don't use this as a bed tray. The boys use it for when they are working on the floor. They either put it over their lap or sit next to it. It's ideal for working close to and on the ground, great for big projects when the children have lots of work on the floor or just want to be cozy/comfortable. It also provides a nice steady surface for using outside and working under a tree or on the grass. JANSJÖ - LED Clamp Light - We attach these to the boys' bunk for night time reading. MOSSLANDA - Picture Ledge - This is perfect for storing books at the child's height. Ours are going near the bunks to store books and small items within easy reach. These could be nicely placed on a wall just for storing or displaying books. RESÖ - Children's Picnic Table - Fabulous and affordable outdoor setting for children, for reading, working or just for eating snack outside. FÖRHÖJA - Letter Tray - For storing various paper and card in our art area in an ordered way. STUVA - Bench - This bench is the perfect size for a small desk. We are currently using ours as a nature table but know we will get lots of use out of it - it's really functional. IKEA PS 2014 - Balancing Bench - Great for indoor (or outdoor!) 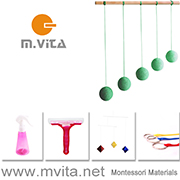 gross motor and development of balance. HÄNGA - Children's coat-hanger - I pick up some of these almost every time I am at Ikea. Simply for hanging the children's clothing. KORKEN - Jar with Lid and BURKEN - Jar with Lid - So useful and easy for children to use. We use these great little jars almost in every room - for our nature area, kitchen, art shelves, even the bathroom for storing bath salts. Sandwich Tray - Pack of 4 - Perfect little chopping boards and will fit into most small trays for work. STUVA - Storage Bench - This storage bench is currently in our entry way (which I am still working on to get it right), where the boys take their shoes off. The boys each have a basket inside for their shoes and school bags. Ikea has so many affordable items for the Montessori home. 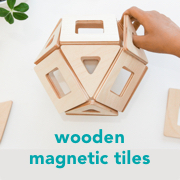 If you like Ikea you might be interested in my previous posts Montessori at Ikea and Fantastic Montessori Ikea Hacks. Please feel free to share your latest Ikea finds!